Organic India Tea Tulsi Pmgrnt Grn by ORGANIC INDIA at Jakis Cafe. MPN: 01184241. Hurry! Limited time offer. Offer valid only while supplies last. Our special blend is made with delicious pomegranate, sweet hibiscus flowers, tart elderberries and notes of refined citrus. 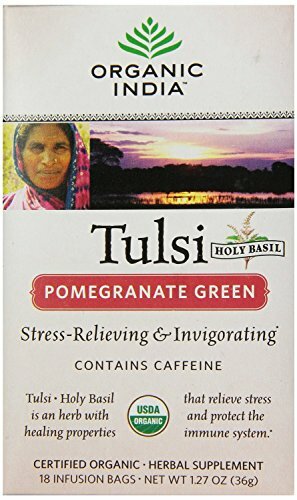 Tulsi pomegranate green tea creates an antioxidant-rich tonic that increases energy levels and improves digestion. Green Tea is made of steamed leaves of the Camellia sinensis plant.